Available in aerosol cans at hardware stores and home improvement centers, spray-on frosted finishes ($4 to $10 for a 12-ounce can) coat window glass with a translucent or opaque frosting that blocks views but allows light in. One can of spray coats about 35 sq. ft. of glass — enough to coat 2 average-size windows. White is popular, but other translucent colors also are available. Be sure to clean the interior surface of your window before applying the spray. Work in a well-ventilated area and apply as several thin, even coats to avoid drips. Spray-on frosts can be removed by scraping the window with a blade. For windows and glass doors where total privacy isn’t necessary, such as the glass surrounding an exterior entry door, use the spray with stencils to create designs that look like they’re etched onto the glass. Opaque and translucent vinyl films ($25 to $125 for a 3-by-5-ft. window) cling to the interior glass surfaces of your windows. You cut them to fit with a utility knife. Window films come in a variety of opacities, patterns, colors, and even “stained glass” looks. Some frosted films contain glass dust that shimmers for a look that mimics real frosted glass. Other energy-efficient window films provide benefits in addition to privacy, such as reducing UV rays and preventing energy loss or solar gain. Peel-and-stick window films cling to window glass with static electricity — a surprisingly dependable method. Properly applied, these films will remain in place for years, yet they’re easy to remove. You can even reapply them to other windows. Adhesive-based films are a permanent privacy solution and can’t be removed. Installing them requires a special kit; once in place, they must be carefully cured for up to 8 days. Adhesive-based films ($20 to $40 for a 2-by-3-ft. piece) have better energy-saving properties than static-cling films, and they last for the life of the glass. Before installing any film, you’ll want to make sure the window glass is clean and free of dust or smudges. That way, you won’t get bubbles and other imperfections. 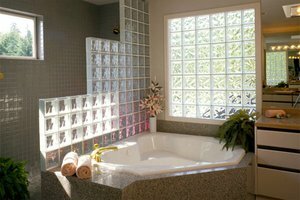 For window privacy, especially inside a shower or above a bathtub, a glass or acrylic block window is another option. The texture of the blocks obscures the view while allowing in an optimum amount of light. Because of their weight, glass block windows usually are fixed in place and inoperable. However, they’re typically less expensive than an acrylic block window of the same size. Glass blocks are also available in colors, and with etched- and frosted-glass finishes. If you prefer an operable window, select acrylic glass block, which is 75% lighter in weight than glass block. Glass and acrylic block windows are available pre-assembled and set into a frame for installation like a standard window. A 2-by-2-foot acrylic block operable casement window sells for about $450, uninstalled. If you prefer a more traditional look, an energy-efficient window with decorative, translucent glass (similar to a leaded glass window), costs $400 to $600 for a 3-by-5-ft. double-hung window. Although etching cream is a good option for frosting small amounts of glass, such as on glassware or a mirror, etching an entire window with cream isn’t recommended since it’s nearly impossible to achieve consistent opacity over a large area of glass. Exterior Specialties of PA is here to help with all of your window installation, window repair, window maintenance and window replacement needs. Call us today at (215) 453-9180 for your FREE Estimate!